CrystalMaker Software has announced the release of version 8.2 of their eponymous software, CrystalMaker. It costs £240 (US$363). CrystalMaker is used by scientists, chemists and educators to visualize the structure of crystals and molecules. 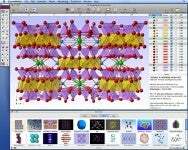 It works hand-in-hand with other CrystalMaker software like CrystalDiffract and SingleCrystal. The new 8.2 version can produce 3D color graphics without requiring an expensive LCD shutter headset or special graphics card or display. It works using red/blue stereo glasses — producing what’s known as an anaglyph image. Other new features include new gradient fill options, background pictures with accelerated graphics and live modeling and rendering controls. System requirements call for Mac OS X 10.4 or later.